Oil on cardboard, 25 x 21 cm. 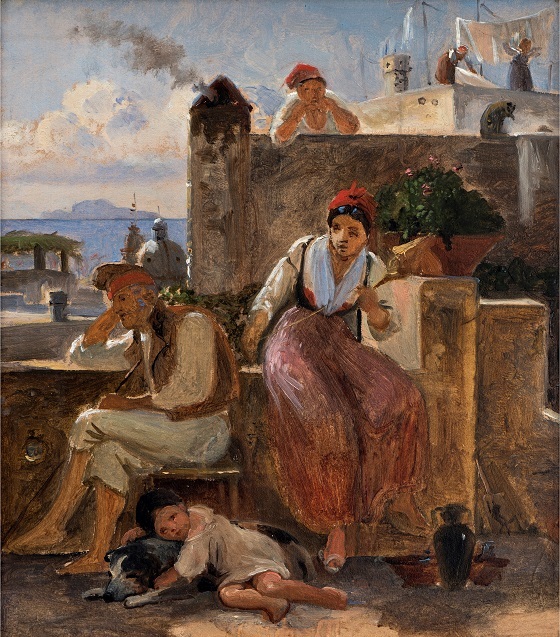 A Neapolitan fisherman’s daughter listens hopefully for her lover’s whistle as her father naps beside her. After his stay in magnificent Rome, Wilhelm Marstrand encountered a smellier and noisier city on the next leg of his journey, Naples. In spite of this, he found a quiet subject in this Neapolitan fisherman’s family. Marstrand likely observed this scene near the place where he and other artists lived, on the square by Naples’ harbour. From this vantage point, he was able to look across the sea to Mount Vesuvius and observe the dynamic hustle and bustle of the harbour below.